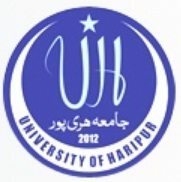 The University of Haripur (UoH) is one of the newest institutions of higher education in the world. 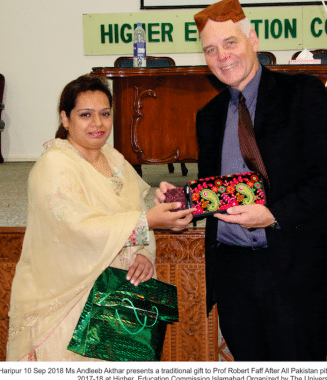 Founded on September 4, 2012 in the Hazara region of Khyber Pakhtunkhwa, Pakistan, UoH hopes to enroll 10,000 students by the 2017-2018 school year. The premises of the UoH campus were once a Rosin and Turpentine factory. The school offers degrees in 13 academic disciplines, including information technology, public health, religious studies, and others. Since its first day, the university adopted a slogan that speaks to its civic commitment: “Restoring Hope; Building Community“. The UoH envisions the creation of an atmosphere that enables students, staff and the wider community to be engaged with and contribute to social responsibility and sustainability across the university and beyond. The university implants its pledge to social responsibility and sustainability in the curricula, policies, plans and procedures. It builds a positive intellectual, educational, economic, scientific and cultural contribution to society; inviting residents of the wider community to use educational facilities, conferences, and cultural and sporting events to connect to university life. Earth Day: The Department of Environmental Sciences and the Department of Forestry and Wildlife organized students took the lead in observing this international holiday, connecting the global to the local. Poster presentations were made by students, with a keen view toward problems related to the environment. The Office of Research, Innovation and Commercialization (ORIC) and the Department of Agriculture collaborated with a local non-profit organization (Badbaan) to organize training sessions for farmers of Haripur. The title of the presentation was “New Methods and Technology of Agriculture Marketing, Crop Protection & Tunnel Farming Technology.” About 70 progressive farmers and growers of the region took part in this training session. The Department of Agriculture also organized a number of training workshops for the farmers on cut flower production and tunnel farming during the last year. A daylong seminar on “Police and Public Cooperation” was organized by students of the Wings Society. The basic objectives of the seminar were to discuss disorder in society, the role of law-enforcing agencies, and the rights and responsibilities of the public in this regard. Several blood camps have been arranged in the university each year. In each one, more than 300 bags were collected and donated to the different hospitals and health organizations. Through various drives, the university has collected and donated more than 6000 books to different colleges of the Haripur, Khanpur and Ghazi areas. Employees of UoH donated one day salary to the Internally Displaced People of North Waziristan Agency.